A JAMA editorial calls for CMS to release Medicare Advantage encounter data to allow taxpayers to see how their money is being spent on its growing number of beneficiaries. The article concludes that if the data is good enough to pay providers from, it’s good enough for the public to see. From Jagged Pill: “Re: Orlando Health’s CIO position. It’s interesting to compare the stated job requirements with the credentials of the chosen candidate.” The job description doesn’t contain the requirement that the new VP/CIO have experience in an organization of similar size ($3.4 billion), but some might be surprised that new CIO Novlet Mattis got the job with just four years of CIO experience, all of that accrued in one-hospital, $954 million Rex Healthcare (NC). She came from Ascension Information Services, so maybe there’s a consulting connection there. 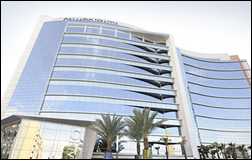 The job description also says that Orlando Health will be choosing a new EHR and replacing its best-of-breed systems, which will be a huge loss for Allscripts (Orlando Health paid them $5.1 million in FY2016, according to tax filings) and a big win for Cerner or Epic. A local announcement says the IT department’s annual budget is $145 million. According to those same tax filings, retired CIO Rick Schooler was making $785K per year. Another interesting tidbit is that Orlando Health’s VP/CIO position reports to the CFO, which is almost unheard of except in small hospitals where the primary objective is controlling cost. From Jack Anape: “Re: Mitre’s report on Cerner interoperability. Will the VA make it available to the public?” I haven’t heard what’s in the report, but I would bet the VA won’t release it publicly, especially since it looks like there’s about an 80 percent chance that VA Secretary David Shulkin will be shown the door after ending up on the wrong end of White House infighting. What the report says is anyone’s guess, but given that its emphasis was on how Cerner would interoperate seamlessly with whatever EHRs are being used by community-based providers that might treat a veteran, it doesn’t seem likely that the report will provide a ringing endorsement. There’s also the chance the White House-pushed, no-bid contract Cerner signing could be put on hold or the EHR decision process restarted if Shulkin isn’t there to promise Congress that this time, the VA really, really, really won’t blow through taxpayer IT billions without much to show for it. I’m enjoying the responses to “What I Wish I’d Known Before … Taking a Travel-Heavy Job.” Add yours and you’ll see it in this weekend’s write-up. Welcome to new HIStalk Platinum Sponsor WebPT, the most-trusted, industry-leading rehab therapy software platform. The Phoenix, AZ-based company’s robust, Web-based solution – created by a therapist for therapists — offers EMR, scheduling, documentation, billing, outcomes tracking, business reporting, patient engagement tools, and system integration in enhancing patient care and driving business growth regardless of staff size, facility type, or number of specialties. The company has a 99 percent customer retention rate, 99.99 percent uptime, 10,000 clinic customers, and 79,000 member users. The company announced last week its acquisition of BMS Practice Solutions, the largest rehab therapy RCM company. WebPT offers video testimonials and case studies that explain why more therapy professionals rely on WebPT than any other software. Industry long-timer Nancy Ham is CEO and board member. Thanks to WebPT for supporting HIStalk. Here’s a physical therapy practice’s WebPT testimonial that I found on YouTube. Welcome to new HIStalk Platinum Sponsor Philips Wellcentive. The Alpharetta, GA-based company has since 2005 driven quality improvement, revenue growth, and business transformation for healthcare organizations that are transitioning to value-based care. The company’s population health management solution boosts clinical, financial, and human outcomes and has been recognized as a PHM leader by KLAS, IDC, and Chilmark. Philips Wellcentive helps its customers provide care management for nearly 50 million people, using intelligence gained from 2.5 billion data points each month to earn $700 million each year in value-based revenue through improved outcomes. I interviewed PHM Business Leader Niki Buchanan a couple of weeks ago. Thanks to Philips Wellcentive for supporting HIStalk. Inovalon reports Q4 results: revenue up 19 percent, adjusted EPS $0.06 vs. $0.05. Shares rose 9 percent in the past year vs. the Nasdaq’s gain of 23 percent. 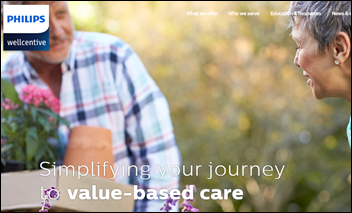 The Sac Valley Medshare HIE chooses Diameter Health for clinical data normalization and standardization services. Datica hires Christopher Gerg (Gauntlet Consulting) as CTO/CSO. Ciox Health hires Florian Quarre (Deloitte) as chief digital officer, David Dyke (Change Healthcare) as VP of product management, and Paula Lawlor (Accuity Delivery Systems) as EVP of provider solutions. Sumit Nagpal (LumiraDX) joins Accenture as managing director and global lead for digital health strategy. 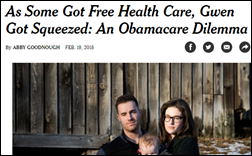 A perceptive New York Times article says that a widening gap between Americans who pay full price for their ACA marketplace health insurance and those who get free or heavily subsidized coverage causes some of the resentment against social programs that middle-class citizens pay for. It concludes that the only universally liked social programs are Social Security and Medicare because everybody benefits from them. 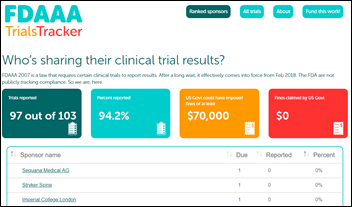 Researchers create a live tracking website to call out organizations and individuals that aren’t complying with a new law that requires that all completed or abandoned FDA-registered clinical trials to publish their results, good or bad. Interestingly, the FDA itself has no plans to do tracking of its own. Clicking an organization’s name shows every clinical trial that it has underway, which then links to the ClinicalTrials.gov site for full study details. HHS issues a proposed rule that will allow insurers to sell short-term health insurance plans that don’t meet ACA requirements. CMS says lower premiums will allow people to buy insurance who otherwise can’t afford it, although it doesn’t mention that bare-bones plans historically have barely resembled real health insurance with a long list of excluded services and no coverage of pre-existing conditions. Not to mention that they will likely destroy what’s left of the marketplace risk pool. I looked at some of the plans offered and they have deductibles as high as $12,500, 40 percent co-insurance up to a maximum of $10,000 annual out of pocket, no coverage for conditions that have been treated in the preceding 24 months, and a lifetime maximum of $600,000 (your cancer and stroke crystal ball had better be accurate). HHS Secretary Alex Azar said in a tweet that the change will offer people “quality, affordable healthcare that works for them,” although he didn’t mention whether he or members of Congress who are covered by generous, taxpayer-paid plans with ACA-mandated coverage are planning to trade theirs in. California Attorney General Xavier Becerra says he won’t sign off on mandatory physician use of its CURES prescription drug monitoring program until its security has been certified. A KLAS report on clinical mobility finds that few hospitals are keeping late-model iPhones for employee use like they did before the iPhone 6, with some of them instead moving to Zebra phones because of the iPhone’s shortcomings (lack of ruggedization, poor WiFi connectivity, and lack of swappable batteries). The iPhone is still the first choice for executives and doctors who get a hospital-provided phone to keep. 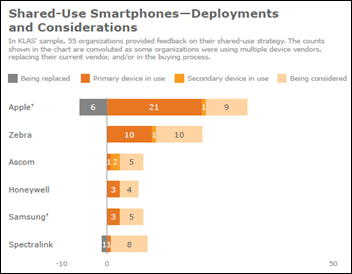 BYOD strategies include paying employees a stipend for using their own phones for work, providing secure texting apps, securing the device remotely via mobile device management, offering remote system log-in as a value-added option, allowing employees to disconnect while not on call, and blacklisting apps if necessary. 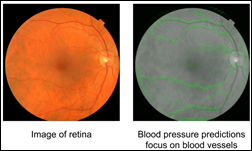 Google researchers apply deep learning to images of the eye (specifically the retinal fundus) to accurately determine cardiac risk factors, such as a patient’s age, gender, smoking status, blood pressure, and likelihood of having a heart attack. They hope to expand their work with a larger dataset in which more cardiovascular events occurred and to fine tune their risk prediction by looking at lifestyle changes or medications. 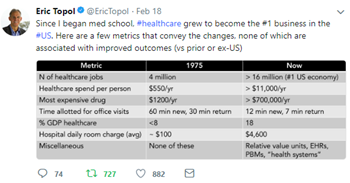 Eric Topol notes that healthcare has morphed from a small industry to the country’s largest without improving outcomes. A tiny physician survey finds that three-quarters use mobile health in their practice, but mostly only for internal messaging or for quick EHR lookups on their phones. Almost no practices offer telemedicine visits, although that doesn’t necessarily mean their patients aren’t using it – maybe they’re just getting them elsewhere. Few practices accept information from patient wearables, most commonly because the data doesn’t flow into their EHR , although I would bet the real reason is they aren’t being paid to review the information and are afraid of being sued if they miss something. A medical resident’ s opinion piece ponders whether “the academic arms race” gunner competition among medical school applicants creates better doctors or perhaps instead burns them out. It made me think – are intelligence, drive, and competitiveness the best predictors of being a caring doctor? Experts warn that the US military’s planned surge will struggle since three-fourths of Americans aged 17-24 are ineligible to serve because of obesity, other health conditions, criminal backgrounds, or lack of education. From the non-military viewpoint, that means employers will either have to hire them warts and all or they’ll be unemployed and thus supported by taxpayers. In Australia, the Royal Australasian College of Physicians goes back to paper for its medical trainee exam after its first attempt at using a computer-based system locks users out five hours into their test. Test-takers who were planning to leave immediately afterward for vacation or to curl fetally in the corner from panic attacks over their future now have to prepare for the paper re-test that will be administered on March 2. Hands On Technology will integrate Ability Network’s RCM application into its rehab EMR/PM. PatientKeeper and its owner HCA are awarded a patent for the way its software displays the most relevant patient information based on the user’s specialty and preference. 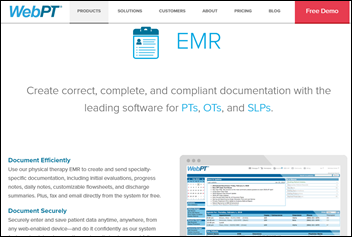 SSI launches an analytic product for ambulatory surgery centers. Audacious Inquiry delivers more than 5 million clinical event alerts per month via its Encounter Notification Service. The Tech Tribune includes CareSync in its list of the top 10 best tech startups in Tampa, FL. CTG acquires Paris-based consulting and digital services business Soft Company.